Oh, Stadri Emblems, what that everyone had your attentive and kind customer service! Wahoooooo y'all! Wahooooooooooooooo! New badges arrived today from Stadri Emblems, who I highly recommend, and I am thrilled to see them. They feel like currency. 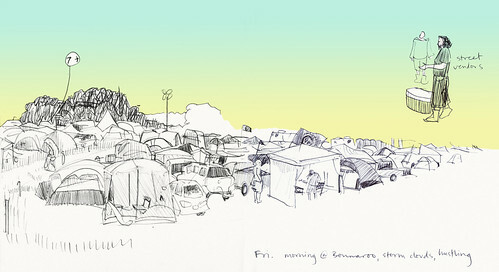 Looking forward to working with many Bonnaroo patrons and giving out many badges at the festival. Speaking of Bonnaroo, if you're going to be there, stop by and see us in the Victory Garden or the Carbon Shredders Booth. We'll be talking about basic gardening skills, companion planting, vermicompost, edible perennials, mushroom cultivation, and seed bombing. 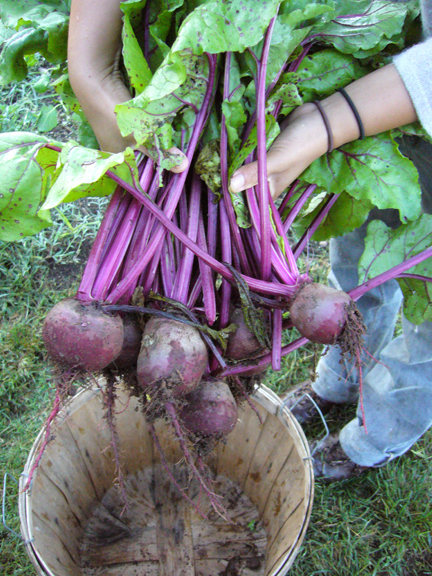 Additionally, we'll be working on site to expand the garden, trade seeds, and meet other growers and land stewards. At the Carbon Shredders Booth you can sign up to be an Urban Land Scout, learn about reducing your carbon footprint, wash your clothes with some Seventh Generation detergent (mmmm...clean laundry), learn about some of the green businesses that support the Carbon Shredders booth, collect some Bonnaroo compost for your home garden, and a host of other small steps towards urban sustainability. You can also sit in the shade and take a break from the exuberant mania of the festival. In other news, I believe we've almost met our financial goal for Urban Land Scout Camp at CAC Beardsley Community Farm. Now we need to find campers. If you know a rising 5th, 6th, or 7th grader at any of the schools listed below (UPDATE: We are opening camp to all 5th, 6th, and 7th graders living in Knox County) please download this application and put it in their hands. 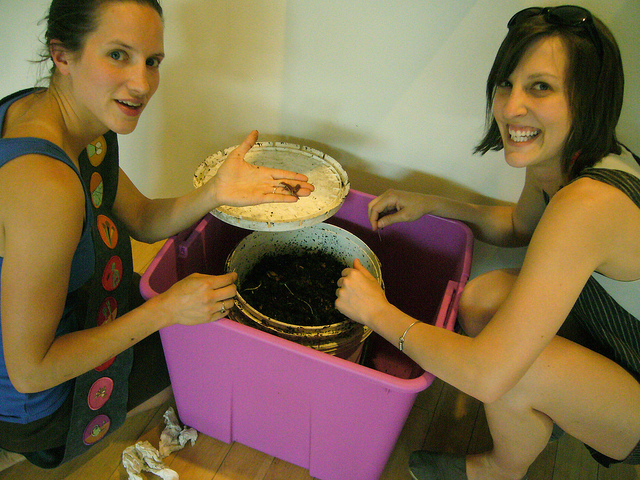 Level 9 - Composting with the help of worms! Join us this Wednesday afternoon, 5-7 pm at CAC Beardsley Community Farm (1719 Reynolds St., behind the Cansler Boys and Girls Club) for our second to last free workshop. This week we'll tackle Level 9: Composting with the help of worms. 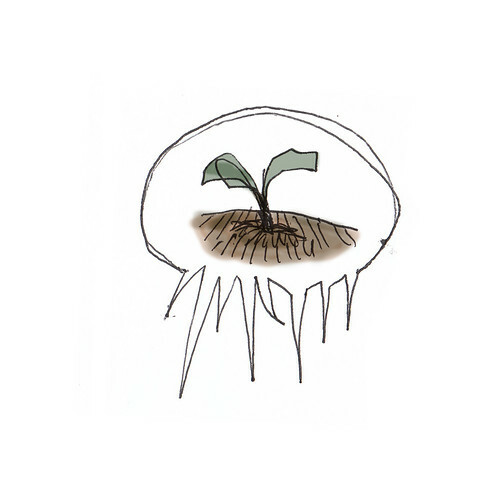 We'll be joined by accomplished gardener and vermicomposter S. Elliott. She'll lead us all in making a home vermicomposter with a five-gallon bucket. Great! Hope to see you all out. Please call the farm phone with questions (865-546-8446). We will meet rain or shine. Will we see you in Manchester, TN? 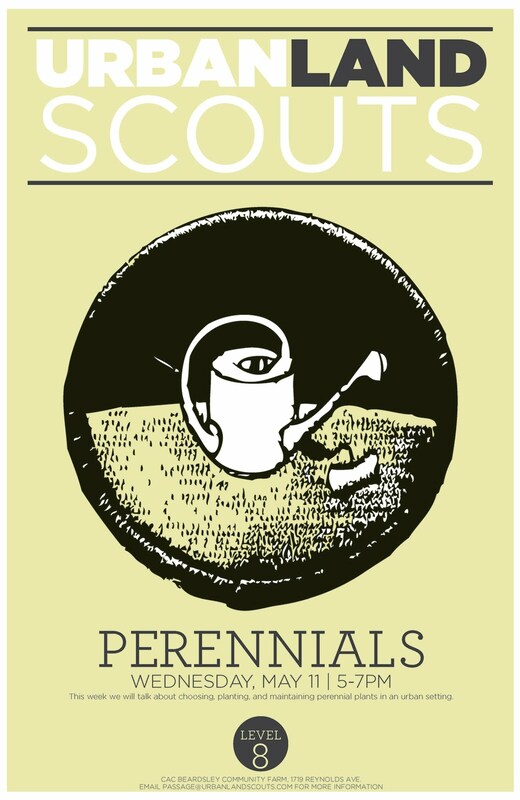 Some strapping young Urban Land Scouts will be running the Victory Garden at Bonnaroo and helping out in the Carbon Shredders Booth. If you or folks you know are going to be at Bonnaroo, make a point of stopping by the garden or CS Booth to introduce yourself and earn a badge. Both the Victory Garden and Carbon Shredders can be found in Centeroo near the post office. You can also earn a limited edition badge and an heirloom plant through the Clean Vibes Trading Post (while supplies last). Fundraising for Urban Land Scout Camp! 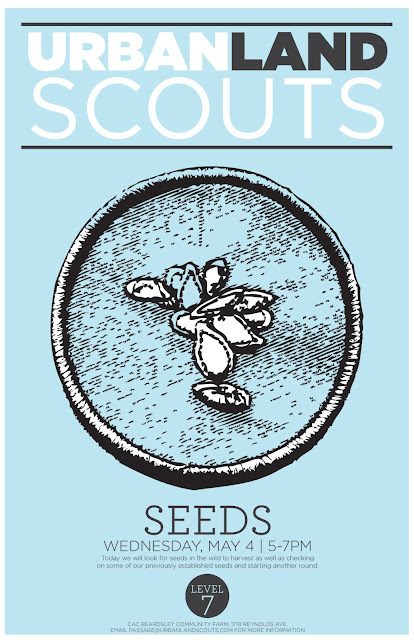 If you missed the earlier post on Urban Land Scout Camp, here's the skinny: We hope to host a free Urban Land Scout day camp at Beardsley Community Farm this summer. In order to make the camp free for our campers, we need to raise money now. That's where you come in. We're hosting a fundraiser this Sunday, May 15th, from 6-9 pm at the Birdhouse, 800 N. 4th Ave. We're asking for a suggested donation of $5 - 10. We'll have beer, snacks, and music by Joseph Gillenwater and Emily Robinson. You can learn more about the camp, why it's a good project to support, and other ways you can get involved...all while enjoying cold beverages and fine company. Sadly, there is not yet a badge for drinking nice beer and eating snacks. Please help us spread the word. We don't want any beer left over. This Wednesday we will gather at CAC Beardsley Community Farm to talk about perennial plants. Perennials are plants that return for at least two seasons. More on that later. Hope to see you out: Wednesday, May 11th, 5-7 pm, 1719 Reynolds St. (behind the Laura Cansler Boys and Girls Club). This fine poster by Rival Collective. 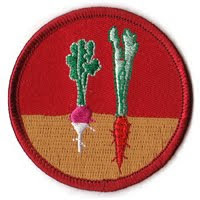 Each day we will gather together for healthy meals, farm chores, art making, and earning a different Urban Land Scout badge. We hope to host twenty students each session. If you know a young person (or a parent of a young person) at any of the schools below who might enjoy Urban Land Scout Camp, please put them in touch with us or print out this application and give them a copy. Thanks for helping us spread the word. We will be accepting applications until June 16th. There will be a mandatory meeting and Open House at Beardsley Farm on June 16th for accepted campers and their parents. Lastly and most importantly, this camp is made possible at no cost through the generous donations of local businesses as well as through the generosity of individuals in our community. This project is not yet fully funded and is contingent on having that funding before we can confirm with our campers. We need any and all financial support you can offer. If you’ve ever enjoyed summer camp or the great work at CAC Beardsley Community Farm, we hope you’ll consider making a donation today. All donations are tax deductible. You can join the ranks of the Tomato Head, Cruze Dairy Farm, and Community Television of Knoxville, to name a few of our sponsors. You can click on the button below to make your tax-deductible donation (to Schools of Influence Education Foundation) in support of Urban Land Scout Camp. If making a donation online isn't your thing, mark your calendar to attend our camp fundraiser Sunday, May 15th, from 6-9 pm at the Birdhouse (800 N. 4th Ave.) A suggested donation of $5 -10 gets you in the door for fine beverages, nice snacks, and good company. This week we will be joined by John Coykendall, gardener and seed saver extraordinaire.